A: For six thousand years, sled dogs have served as the principal form of transportation for the native peoples of the north. As white settlers, gold miners, and fur trappers moved into what is today Alaska and the northern territories of Canada, they, too, used the dog team for winter transportation. When gold camps boomed in the interior the demand for mail and general supplies deliveries during the winter months were provided by sled dog teams. One of the major routes followed by the teams was the Iditarod Trail, which crossed Alaska from Seward on the Kenai Peninsula to Nome on the Bering Sea Coast. In the winter of 1925, a diphtheria epidemic struck Nome. The anti-serum required to stop the epidemic needed to be quickly transported to Nome, but no roads to Nome existed, ships could not sail through the pack ice, and air travel was too dangerous. The Iditarod Trail was the only answer, and a group of 18 dog teams and musher’s relayed the serum 674 miles from Nenana to Nome. This is the well-known story of Balto – the lead dog of the initial serum race. Clearly sled dogs were a key part of Alaska's early history, but they began to disappear as snowmobiles, airplanes, and roads arrived in Alaska during the middle 20th century. In response to this disappearance, Joe Redington Sr. and a group of musher worked together to start a race across Alaska that followed the old Iditarod Trail. This race was the Iditarod Trail Sled Dog Race, and it has become the world's premiere sled dog race since its first running in 1973. A: Yes, but only the middle part – approximately 300 miles of the trail alternates. The Northern Route, used in even-numbered years, heads north from the checkpoint of Ophir, reaches the Yukon River at Ruby, and travels downriver to Kaltag. The Southern Route, used during odd-numbered years, heads south from Ophir, passes through the ghost town of Iditarod, and reaches the Yukon River just below the checkpoint at Anvik. The trail then heads upriver to Kaltag. From Kaltag the trail is the same every year to the finish, and the trail from the starting line to Ophir is also the same each year. Please refer also the Iditarod Trail Map. 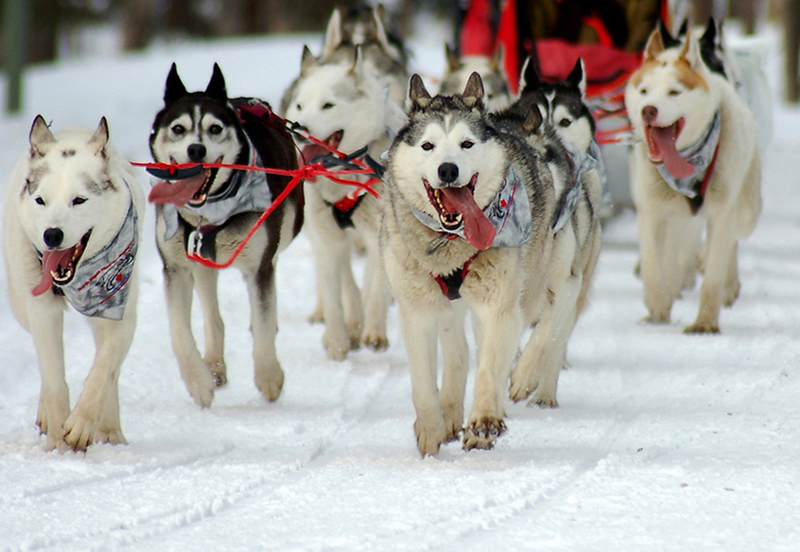 A: About 60-90 musher’s usually start the race. The largest number of musher ever to start the Iditarod was in the 2000 race when 82-musher left the starting line. The most to ever finish was in 2004 when 77-musher successfully made it to Nome. No limit has been imposed on the number of entries, but talk has been made of limiting the number to 100 teams if needed at some point in the future. A: Any qualified musher is welcome to enter the Iditarod. A qualified musher is a person who is at least 18 years of age, is in good standing with the Iditarod Trail Committee, and has met one of the two following requirements: successfully finished a previous Iditarod or successfully finished two approved qualifying races totaling 500 miles or more in the 24 months prior to the start of the Iditarod the musher wishes to enter. A: Yes, women have both competed in and won the Iditarod. In fact, women have raced in every Iditarod since 1974, and currently about a dozen women run the race every year. Two women have won the race. Libby Riddles was the first woman to win the race when she braved her way through a storm in the 1985 Iditarod. Susan Butcher has won four Iditarod’s in the years 1986, 1987, 1988, and 1990. Because of Libby Riddles and Susan Butcher hold on the winner's circle from 1985 to 1988, the Iditarod Trail Committee trademarked the phrase: - "Alaska: Where men are men and women win the Iditarod." A: Yes, the race trail has a total of 26 checkpoints between the Wasilla starting line and Nome. The checkpoints vary from people's homes along rivers to old cabins in the woods to villages and ghost towns. A few checkpoints are just remote place where planes could land to drop off officials and food and set up tents. The checkpoints are sort of the activity centers for the race. All of the veterinarians, officials, and food for musher and dogs are at the checkpoints. When a team arrives at a checkpoint, a checker signs the team into the checkpoint and records the time, date, and number of dogs in the team. Checkers also point out the location of camping sites for the team, the food drop bags (if a food drop checkpoint), and water (if available). Teams are not required to rest at every checkpoint, however, so sometimes teams just pass through and head out on the trail again. Other times, teams stop for a rest. A: The Iditarod rules require a total of three rest stops. The first rest stop is a 24-hour stop that must be taken at a checkpoint of the musher's choice along the trail. This rest is typically taken between 300 and 600 miles into the race. The second rest stop is an eight-hour stop that must be taken at a checkpoint along the Yukon River. The third and final required rest stop is an eight-hour stop at the village of White Mountain, 77 miles from the finish line in Nome. A: The Iditarod Trail Breakers are some of the most hard-core snowmobile driver in the world. They make a 1,100-mile "highway" across Alaska every winter. About 10,000 pieces of surveyor's stakes with orange paint and reflective tape are used to mark the trail. Additional ribbons and tripod markers are used in places like the Alaska Mountain Range and the Bering Sea Coast. The rules require musher to stay on the marked race trail. Despite such a heroic marking effort, winds, passing dogs and snowmobiles, and even wild animals can knock down markers. Musher still must know how to find and search the snow for signs of other dog teams. A: The Iditarod Champion receives over 100,000 dollars in cash plus a brand new Dodge Ram 4x4 pickup (Alaska’s Dodge Dealers are a major race sponsor). A total of about 800,000 dollars is distributed to the top 30 finishers in the race each year, and every musher who finishes the race is awarded $1,049. A few other smaller prizes are awarded along the trail to the first musher into the checkpoints of McGrath and Unalakleet, as well as the first musher to the halfway point and the Yukon River. Other race awards include the Sportsmanship Award, the Humanitarian Award (for the musher who demonstrated the best dog care) the - Rookie of the Year Award - the most Inspirational Musher Award, and the Red Lantern Award (for the last place musher). A: The Musher's Banquet is held every year on a thursday - e.g. two days before the race start - at the newly build Dena’ina Center in downtown Anchorage. This is your chance to get up close and personal, talk to the musher, take pictures and collect autographs. A dinner is included in the ticket price. During the banquet musher’s usually thank their sponsors and draw starting numbers from a boot. The order in which musher’s pick numbers from the boot is determined by the order in which musher signed up for the race. This banquet draws yearly a crowd of nearly 2000 spectators into the center. The doors are opening around 5:00 pm and the dinner begin at 6:00 pm. Our tours include admission, transfer to the center and the dinner. A: You can participate as an Idita-Rider. Many people want to ride with the musher at the beginning of the race. Seats for the Idita-Rider program are auctioned off a few weeks before the race. The person who bids the highest becomes what is called an Idita-Rider. This is a fund raising event to support the race. The Idita-Rider rides in the basket of the sled for about eight miles across the town of Anchorage. A: After the re-start in Wasilla you may choose to fly to the following checkpoints: Yentna, Skwentna, Finger Lakes and Rainy Pass/Puntilla Lakes. Guests who travel to Nome could visit the following additional checkpoints: Safety, White Mountain, Golovin, Elim, Koyuk, Unanakleet and Shaktoolik. Please refer to each particular tour program. A: The weather is always an unknown variable. From November to early March, when the amount of daylight ranges from 10 to less than 4 hours per day, the lowest temperature readings will fall below zero. Low temperatures of -40 to -50°F or colder occur each winter. Long periods of five to ten or more days of extremely low temperatures occur during the winter months. Nome is the exception, with Norton Sound moderating the local temperatures. While Nome’s overnight winter temperatures typically fall to near zero, readings lower than -20°F are uncommon. From October through April, snow cover is persistent in most areas, without interruption. Colder weather is easier on the dogs, which generally run best in a range from 20-below zero to 20 degrees above. The coldest temperature ever recorded on the Iditarod Race was in ’73 when the temperature with wind chill plummeted to unbelievable –130º F.
A: We can certainly customize a tour for you but it is important to contact us as early as possible because overnight accommodation along the trail is very limited. The same applies to fly-outs from Anchorage to the checkpoints or programs with finishing in Nome. We advertise a “custom program” with a variety of checkpoint fly-out options, program extensions and choice of hotel accommodation. Please contact us. A: Always as soon as possible because our Iditarod Packages 2 and 3 are providing a very limited capacity due to the unique wilderness lodge accommodation and the flights involved. Sometimes tours are booked one year in advance and during some other years you may be lucky to obtain individual space up to two months before a tour starts but this is very unpredictable. A: Gratuities for service suppliers, hotel and banquet staff etc. are not included in our tour rates and should be extended on an individual basis. A: We recommend to pack the following clothing: warm winter boots, shell lining such as Gore Tex or other winter (ski) jackets, windbreaker, wool or fleece pullover, long underwear, gloves, hut, sunglasses, wool socks, wool shirts, jeans, fleece pants. Also take some additional food, fruits and drinks for the days in the wilderness with you. Most stores in Anchorage are carrying a wide variety of healthy outdoor food items. The luggage during fly-outs is limited to smaller soft shell cases or backpacks. Please do not use hard shell luggage on fly-out days. A: The race begins always on the first Saturday in March on 4th Avenue in downtown Anchorage. However, the first race day is just a ceremonial start, and teams run only from Anchorage to Eagle River, 25 miles away. The time from the starting day has no effect on the final outcome of the race. This ceremonial start is done in order to allow for better publicity and coverage for the musher and the race, and it also allows each musher to give one lucky "Idita-Rider" a ride in his or her sled at the starting line. On the following day, the race is re-started in Willow, about 50 miles from Anchorage. This is the official timed start of the race. The reason for moving the teams out of Anchorage for the restart is that the congestion of Anchorage streets coupled with the geographic barrier of the Knik River and Knik Arm of Cook Inlet (part of the Pacific Ocean) make it safest to start in Willow. A: We mainly use reliable Cessna 202/204/206 or deHaviland Beaver for the flight to the lodge or the checkpoints. You may leave all excess (hard case) luggage at the hotel while traveling with ski-planes or staying at the Wilderness Lodge. Please use only soft shell luggage or backpacks for the fly-outs. Thank you. A: Please refer to the separate accommodation section of the website. We reserve the right to substitute the current and/or regularly used wilderness accommodation with a similar category anytime at our own discretion - if regional weather, snow or ice conditions are preventing fly outs to/from the lodge. A: Yes, but it all depends on the weather ! We offer limited snowmobile rental, ice fishing and a bon fire on the first evening to watch the musher passing by the lodge.